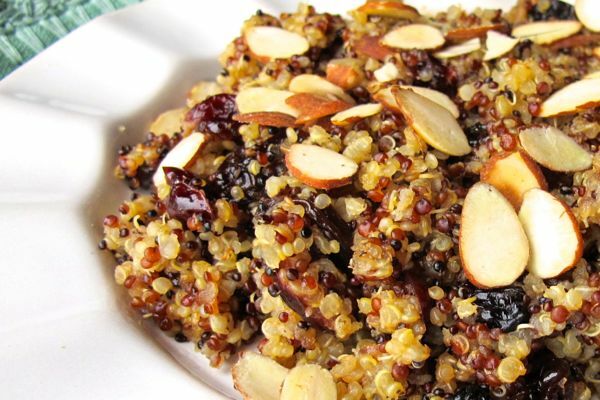 This healthy and flavorful quinoa side dish is a great staple recipe. As seen in this recipe, a Sprouted Quinoa Trio blend that I found at Whole Foods was used due to the appealing mosaic of color. Standard quinoa can certainly be used as well. My husband is from Traverse City, Michigan, also known as the Cherry Capital of the world, and I use dried cherries in a variety of dishes and recipes. Using dried cherries always reminds me of Traverse City and its incredible surrounding areas. Quinoa (pronounced Keen-wah) is an amino acid-rich (protein) seed that has a fluffy, slightly crunchy texture with a nutty flavor when cooked. 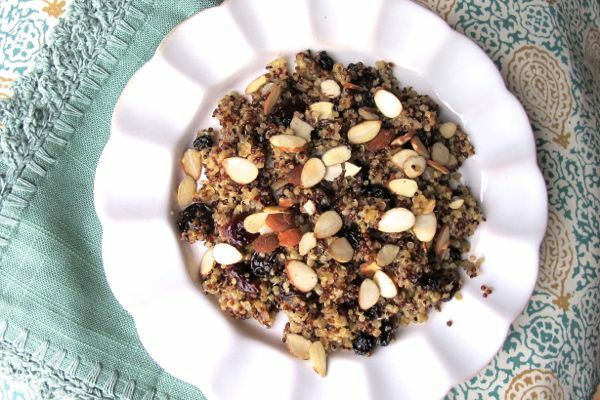 Quinoa has deep South American roots and is an ancient grain-like crop. The Incas called it the “mother grain” and actually revered it as sacred. This little seed is a serious nutritional powerhouse and that is why we love it so much here at Recipe Rebuild. Cooked quinoa is a great substitute for rice or barley and can be used in salads, stews, soups and casseroles. Before cooking, one must rinse the seeds to remove their bitter resin-like coating, which is called saponin. This process has likely been done when packaging but it is recommended to rinse again prior to preparing the grain. More Recipe Rebuild Quinoa Recipes! Dried cherries are rich in antioxidant compounds and are a source of vitamin A.
Toast the almonds by arranging them in a single layer on a baking sheet and bake until lightly toasted, about 6 to 8 minutes. Cool the almonds completely while preparing the pilaf. Place the dry quinoa in a strainer and rinse well. Sauté the onion until translucent and fragrant, about 4 minutes. Add the quinoa and toast slightly, stirring constantly for a minute or two. Add the chicken broth and bring to a boil. Lower the heat, cover and simmer for about 10 minutes. Add the dried cherries and cover again for 10 more minutes or until the liquid is absorbed and the quinoa is tender. Toss in the almonds and parsley, season with salt and pepper to taste and serve. This recipe makes great leftovers as well.